This was certainly the year of the Rolex GMT-Master. The Swiss watchmaking giant launched not just one but three new GMT-Master II models at Baselworld 2018, continuing the legacy of Rolex’s famous pilot watch. With an appealing blend of looks and practicality, the GMT-Master lineup has been one of Rolex’s most popular watch collections since its inception over six decades ago. Unsurprisingly, given its iconic status, we often spot the Rolex GMT-Master watch on famous wrists too. Here are just a few celebrities that wear a Rolex GMT-Master watch. Stand up comedian, writer, actor, and television host, Trevor Noah, took over the reins at Comedy Central’s satirical news show, The Daily Show, from Jon Stewart in 2005. He made audiences laugh while delivering biting political commentary. This has earned Trevor Noah a spot on Time Magazine’s 100 most influential people in the world for 2018. And what does this influential celebrity wear on his wrist? These days, it’s the brand new 2018 Everose gold GMT-Master II ref. 126715CHNR with the black and brown ceramic bezel. A great choice for a comedian who often travels the globe for both work and play. Those familiar with celebrity watch collectors will no doubt have heard about Ellen DeGeneres’ epic collection mostly comprising of top-tier Rolex timepieces. In fact, it almost seems like Ellen DeGeneres wears a different Rolex watch every day while hosting her popular daytime show. 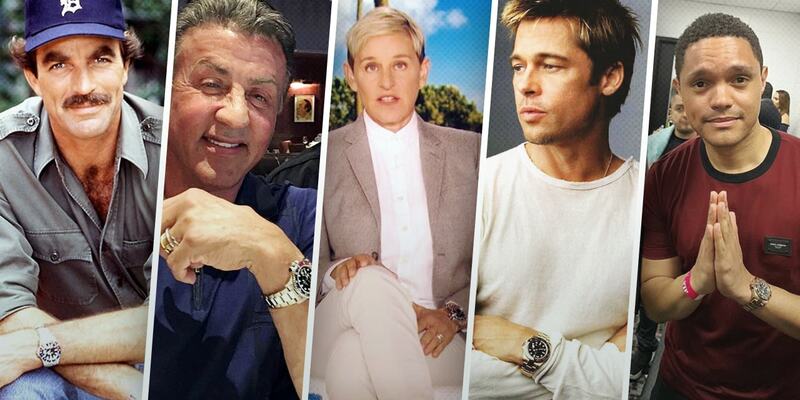 Naturally, with a collection like hers, it wasn’t surprising that Ellen DeGeneres was the first celebrity we spotted in public wearing the brand new 2018 stainless steel GMT-Master II ref. 126710BLRO watch with the iconic red and blue “Pepsi” bezel and Jubilee bracelet. We bet she didn’t have to put her name down on a waiting list! Superstar actor Brad Pitt is another celebrity we’ve seen over the years wearing some incredible luxury watches from the likes of A. Lange & Söhne, Patek Philippe, and Rolex. His Rolex collection is diverse, ranging from gold dress watches to steel sports watches. However, Brad Pitt’s particular GMT-Master blends dressiness and sportiness together since it’s the solid 18k yellow gold GMT-Master II ref. 116718LN with the ultra-modern black Cerachrom ceramic bezel. A serious sports watch for a seriously famous star. If you think a diamond Rolex watch is challenging for a guy to pull off, then let tough guy Sylvester Stallone show you the way. Known for his action-packed roles in movies like Rocky, Rambo, and The Expendables, Sly can rock a gem-set luxury watch like no other. Take for example his white gold GMT-Master II ref. 116759 SARU watch. Not only is it crafted in hefty 18k white gold, but the red and blue “Pepsi” looking bezel is actually fashioned from a mix of sapphires, rubies, and diamonds. Now, that’s an ultra-luxurious take an on Rolex tool watch. Without a doubt, the celebrity most associated with the Rolex GMT-Master is none other than television star, Tom Selleck. While staring as Magnum in the hit 1980s show, Magnum P.I., Tom Selleck’s Rolex GMT-Master ref. 1675 with the red and blue bezel was as central to his look and persona has his mustache, Hawaiian shirt, and red Ferrari. In fact, we recently reported that the 2018 reboot of the show also includes the quintessential Rolex Pepsi. Tom Selleck kept the GMT-Master “Pepsi” watch after the show ended and has commented several times on how much he loves his Rolex 1675—we don’t blame him! From vintage to new, steel to solid gold, the GMT-Master collection is one of Rolex’s most varied. It’s also one that clearly enjoys the attention of the rich and famous too. Stay tuned for our next article where we highlight some celebrities who wear the Rolex Submariner dive watch.